It's another big weekend for Rock in Rio! Day 4 of the festival is slammed with powerful performances from the Deftones, System of a Down, Lamb of God and more big names. 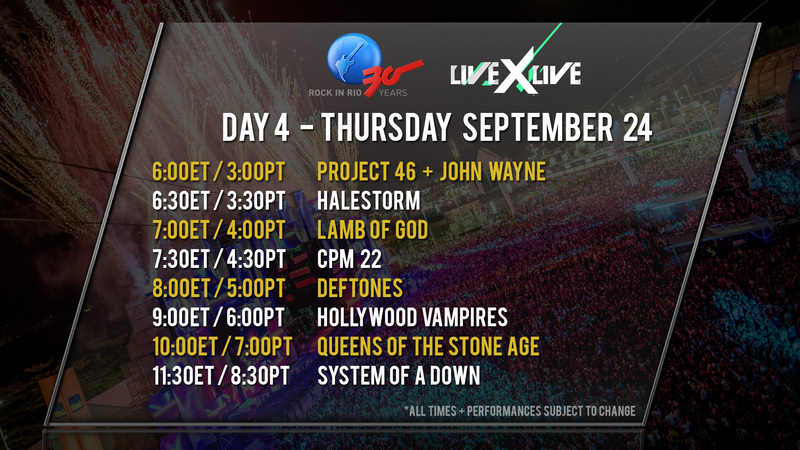 Check out the full schedule above and tune into AOL.com right here to watch the entire festival LIVE from Rio de Janeiro. ABOUT ROCK IN RIO: The major music festival kicked off for the first time in 1985 and since then it's become the biggest music festival in the world with concerts in Rio de Janeiro, Lisbon, Las Vegas and Madrid. The festival brings together artists from all genres, with the 2015 festival including performances from Katy Perry, Rihanna, Elton John, Slipknot, John Legend and more.